Some children (and teachers) celebrate the end of the school year with lots of fanfare, but in Room 3, the experience is bittersweet. 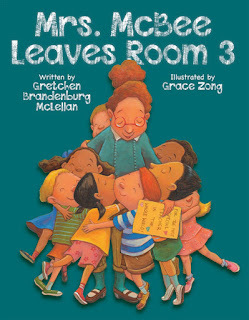 Gretchen Brandenburg McLellan’s debut picture book, Mrs. McBee Leaves Room 3, shows readers that everyone has a special way of saying good-bye. It’s the end of the school year at Mayflower Elementary, and the students aren’t the only ones leaving Room 3—Mrs. McBee will not be returning to school after summer break. In addition to cleaning up the classroom for the end of the year, Jamaika, William, and the other students of Room 3 want to find a special way to celebrate their beloved teacher. But how will they arrive at an agreement when they all have different ideas? Children are continuously experiencing transitions—whether it's new grades, new teachers, or just new everyday experiences. With a distinct cast of lively and diverse characters, brought to life by Grace Zong’s charming illustrations, Gretchen Brandenburg McLellan’s amusing and touching story highlights the mixed emotions surrounding those transitions, and the importance of recognizing, observing, and celebrating them. So be a class act and pick up your own copy of Mrs. McBee Leaves Room 3 on April 1st at your local library, indie bookstore, or Barnes & Noble!